SCDC CO-operative Bank Recruitment Notification – Check Here scdc bank Important Dates, Eligibility Criteira, Pattern & Syllabus, Selection process & Vacancies details etc. 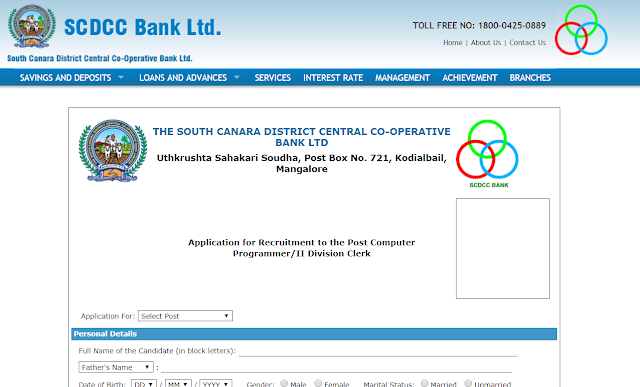 South Canara District Central Co-Operative Bank or SCDC Bank has released Official Notification for the post of Programmers/Clerks exams. If you are Interested to apply and join SCDC Co-operative Bank as a Clerk or a Computer Programmer, Then Check below official Notification PDF. Last Date: 10th January 2018. Get Here SCDC Total Number of Vacancies for Clerk & Programmer Post. Programmer-02, Clerk - 125 Total 127. B.E Degree in computer with min: 03yrs exp. In programming and for clerk any degree with diploma in computer application min 50% Marks. The Selection will on the basis of two stages.